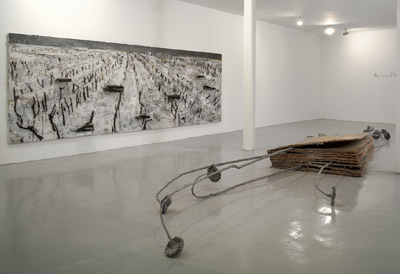 Installation view at Galerie Yvon Lambert, 2006. Anselm Kiefer’s monumental canvases and sculptures, a constant tribute to material and accumulation, are, in this manifestation, an homage to the Jewish poet Paul Celan. While the sheer number of works included in this exhibition require not one, but two Marais galleries, this split allegorizes Celan’s constant displacement as he was forced to move around Europe in times of tyranny, war, and revolution. Kiefer has situated his dedication to the poet in the landscape surrounding Salzburg; despite the persecution of the Jewish people by the German state during Celan’s lifetime, the poet remained committed to the language and culture of his family’s homeland. Books figure into many of the works, including Aschenblüme (Ash Flower), 2006, a cardboard volume—as large as a door—that rests on the floor and presses lead sunflowers and ash between its pages. Also at Yvon Lambert, Asche für Paul Celan (Ashes for Paul Celan), 2006, is a pile of lead, iron, and concrete books and a submarine, all chipped, imbalanced, and listing on the sea-gray poured-concrete floor. At Thaddeus Ropac, Schwarze Flocken (Black Flakes), 2006, finds a stone book spread open against ten by twenty feet of barren earth painted on (and otherwise affixed to) canvas. The spine of this bound text has been broken; it rests in the landscape with the finality of a tombstone. Once again, burden and regret are palpable in Kiefer’s dark and heavy masses. The exhibition is also on view at Galerie Thaddaeus Ropac until November 29.